Last week, Santa Monica-based Docstoc (www.docstoc.com), the online business documents site headed by Jason Nazar, launched a new website, called License123 (www.license123.com). The new site is a separate brand, offering up help to businesses trying to make sure their companies are properly licensed in whatever city and state they are operating in. It's an interesting new strategy for Docstoc, in that License123 exists as its own brand, and we thought it would be great to hear from Jason about the thought behind what it's doing. Can you tell us about the new site, and how Docstoc is doing? Jason Nazar: The quick update on Docstoc, is the business is doing really well. We now have 45 employees, and are doing around 20 million uniques and 25 million registered members. We're continuing to serve small businesses. We recently made a strategic decisions to take the multi-domain and multi-product line approach, and are now looking to build new or buy existing content businesses or productivity tools, so that we can provide the widest selection of value to small businesses online. Docstoc is an amazing start, but not everything can be done directly through Docstoc.com. We started asking ourselves the question: what does every small business need? One answer, was licenses and permits. The process of getting a license and permit today, and figuring out what licenses and permits you need today is mind numbingly painful. The average business needs 4-6 licenses or permits, from the city, state, and federal government. Those licenses and permits are primarily driven by the city that you are in, and what type of business you are running, and might take you two or three weeks of research to figure out. That, or you have to pay a lawyer or accountant, and you might spent more than $2500 and north to avoid being subject to big fines and penalties if you do something wrong. We've streamlined that. What License123 does, is it lets you, as an owner or operator, know exactly what you need to do. You just select the state, city, and industry or type of business you are running, and you get a comprehensive report of what permits and licenses you need, all for $10.00. For now, it's $10, although we'll probably be raising the price, and we also provide you with the exact government forms, tell you how much each will cost, when you have to file, and where it all has to be mailed into, and if there is an online application, we'll link you to that. It's something that would normally take hours of online research, and a lot of hassle and money you might not need to spend. We've replaced that with a five minute process, which costs only $10. That seems like a lot of information to collect. How did you go about getting all that information together? Jason Nazar: We're still going through that process. We've covered about one percent of the major metropolitan areas, covering most of California, New York, and Philadelphia. We actually started looking at cities who had the most businesses formed in a year. It will take us all year to get to 100 percent coverage. We expect, however, that in the next three months we can get coverage of most of the major metropolitan areas. We now have a team of researchers at Docstoc, who are going through the process of looking business-by-business, city-by-city, to pull this information. That's the reason this has not been done before--it's a major effort. However, I think we're in a good position to solve that, and build a big business around it. Why did you decide to launch this as a a separate brand and site? Jason Nazar: Our mission at Docstoc, is to make small businesses better. We want to build this company into the premier destination for small businesses. Historically, we've tried to add different features and product lines into Docstoc, sometimes with success, and sometimes with not so much success. Docstoc has been doing great, is growing, and is fantastic for what it is, a source for premium content subscription with the content that businesses need to start and grow. However, that kind of business shouldn't necessarily be the one for a licensing product. We though the value proposition was significantly different enough that it justified its own domain, experience, and brand. We certainly will leverage our 20 million uniques a month and 25 million registered members to promote License123, and I also could foresee a situation where the premium members of Docstoc might get access to License123 for free, but that's something we'll have to test. I think that the value and product is meaningfully different enough to merit its own experience. To that extent, this year and going forward, we're going to continue to build out multiple products for small businesses and are even looking to buy businesses serving the small business market. Not to tip your hand on acquisitions, but what kind of companies are you looking to buy? Jason Nazar: I'm fine with that, actually. We're looking to buy productivity tools, content sites, and value added services online for small business. What we have at Docstoc, is a great distribution network, which is getting better and better. Whether it is a productivity tool to help complete an action such as filling out receivables and invoices, or a content site which has really good, rich content focused on small businesses, which could do better as part of a larger network, or it might be some kind of online service providing expert advice for small businesses. Those are the kinds of things we see that could continue to provide lots of value for our customers. On a completely different topic, what do you think about the whole thing about Silicon Beach? Looks like you're right in the center of that. 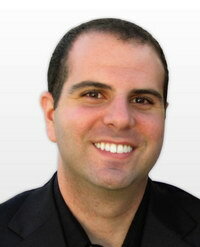 Jason Nazar: I love the notion of Silicon Beach. Some people have mixed emotions about the name, but it's interesting, because I remember when we were the new kid on the block and just starting out. Now, we're one of the veteran companies in Southern California. This is year five since Docstoc went online, six if you count when I started working on it with my co-founder Alon. The fact that now, there are dozens of companies within a one square mile radius of us, and hundreds within five miles, and the fact we're aggregating all those companies here, makes this the coolest place. I love it here, and grew up in Los Angeles my entire life, and it's really special and amazing that we're now getting national attention. I love it that people in New York, San Francisco, and Chicago are wanting to talk about Silicon Beach. I love it that amazing companies like Beachmint, BetterWorks and Goodreads are all aggregating around the area, and I think it's probably the most exciting time in So Cal tech since I started Docstoc and got into the industry. I'm really excited on where it goes from here on out. Thanks, and always great to talk with you!